Glenohumeral internal rotation deficit, or GIRD, is a cause of shoulder pain in throwing athletes. It is most commonly seen in baseball players, although you can see it in high-level tennis players and other overhead athletes. Usually it is a problem that develops over time rather than following an acute injury. Most athletes with GIRD complain of vague shoulder pain with overhead activity. Throwers might notice decreased control or velocity on their throws. Occasionally they might note a decrease in motion. Physical examination by a sports medicine physician is usually diagnostic. The physician will examine the internal rotation and external rotation with the shoulder abducted. 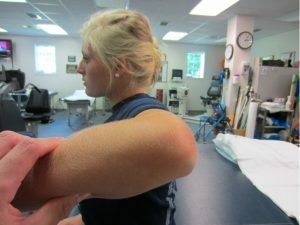 The physician often notices increased external rotation but decreased internal rotation compared to the nondominant shoulder. Now this is common in throwing athletes to a certain extent. But if the loss of internal rotation is significant, then GIRD is likely the cause of the patient’s pain and decreased performance. Athletes with glenohumeral internal rotation deficits will have decreased internal rotation of the involved shoulder. Treatment starts with physical therapy for stretching the posterior and inferior capsules. Often the therapist will teach the athlete stretches that can be done on his or her own as well. In the rare circumstances where physical therapy for posterior capsular stretching fails to relieve the problem, surgical treatment can be employed. Surgery usually involves arthroscopically releasing the affected posterior and/or inferior capsules to restore range of motion. Another consideration with glenohumeral internal rotation deficit is the potential risk of associated lesions. This problem is often part of a spectrum that involves other pathologic entities. If a thrower is not getting better or continuing to have symptoms after resolution of the posterior capsule or tightness, the physician will also look for secondary injuries, such as a superior labral tear (SLAP tear) or rotator cuff injury.